AMD FX Processors unlock maximum, unrestrained processing performance for extreme responsiveness you can see and feel - for a top-tier experience with Windows 10 and DirectX 12. Now paired with virtually silent top-of-the-line thermal solution, the new Wraith Cooler generates less than one-tenth the noise of its predecessor, backlit illumination and an attractive fan shroud. 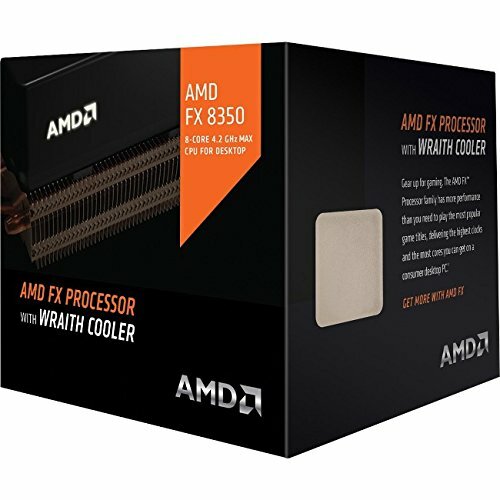 The Black Edition FX 8350 offers unlocked clock multiplier for a powerful overclocking advantage and highly configurable power and performance curve via AMD OverDrive software. Supreme power available from virtually every core configuration delivers aggressive performance for mega-tasking and intensive applications like video editing and 3D modeling.